Mondays: Squash House League: Executive Squash & Fitness offers the largest House League in Toronto. Players of all levels participate at their own level. House Leagues run three times a year, during the summer, fall and winter. 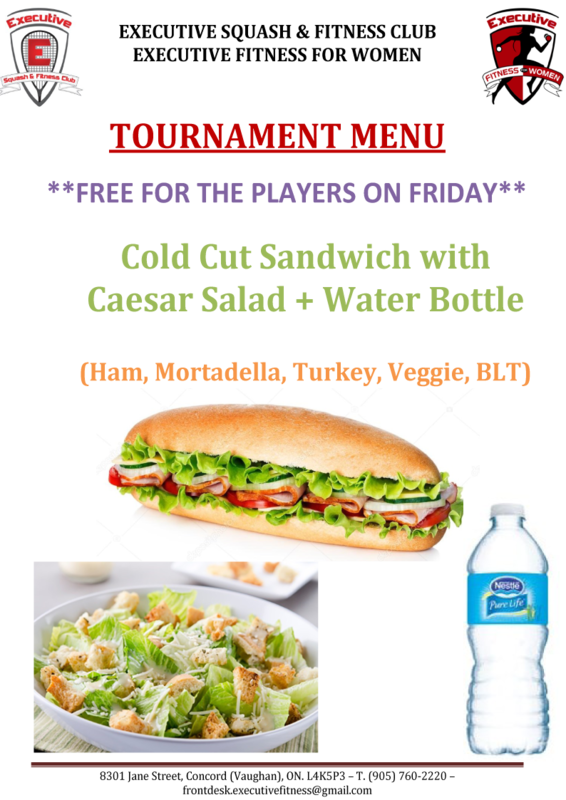 Players are scheduled one match per week on Monday evening and each house league ends with an enjoyable awards banquet and dinner. Monday @ Noon: Advanced Training Session: A lunch time program for advanced players is held from noon until 1:15 pm. A great way to kick off your week! Tuesday – Thursday Evenings: Toronto and District Squash League (T &D) provides interclub competition as they travel throughout the city challenging other clubs. Executive has a strong tradition within T&D and has representation at all levels from E to A. You don't have to play to enjoy the action. Everyone is invited to come out, watch and support Executive Squash & Fitness teams and decide if the inter clubs are for you. Thursday 9:30am -11:20am: Instructional Training Session: Players of all calibers are invited to attend and receive pointers from the club pro. It’s a great way to improve your game and meet others members! Thursday 8:40pm- 10:40pm: Training Session: Enjoy an evening of active play. Coaching and matches will be arranged for you with an eye toward improving your game. Join the gang for great games, lots of fun and of course to cool down in the lounge afterwards! Open to all levels of play. Friday 4:40pm-6:00pm: Training Session- works on skills individually and as a group to help ready yourself for participation in House League play. Saturday: Instructional Training Session: A prime way to help members of all levels to improve their squash skills. Rob Brooks and his Squash Staff will work with you on court and then you can practice those skills with other players at your level. Novice- 10am-12pm, Intermediate 12:40pm – 2:40pm, and Advanced 2:40pm-4:40pm. Junior Summer Training Sessions: The summer is the perfect time for junior squash players to improve their skills and fitness levels during the day with school completed until fall. At Executive we offer training sessions during the months of July- August to capitalize on the free time. This instruction is free to Executive Squash yearly junior members. We divide into three different levels.